The market rebounded from the oversold condition. 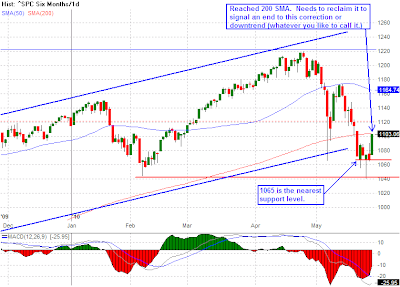 The SP500 bounced back up to test the 200 SMA near the 1100 level. 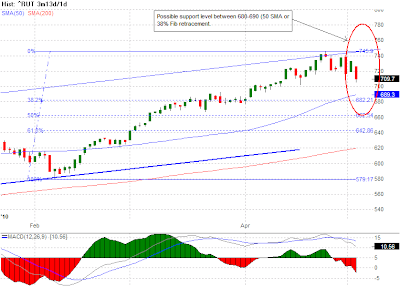 In the short term, the SP500 most likely will attempt to reclaim the 200 SMA. However, there could be another test down in the 1065 range before the SP500 can decisively reclaim the 200 SMA and start its move back toward the 1175 level. Tomorrow is the Friday of a Monday holiday (Memorial Day), and trading traditionally is light on a Friday before a long weekend. Therefore, depending on the market’s activity level for tomorrow, I will not read too much into it. Next week, I will be watching closely on how the SP500 reclaim the 200 SMA and how it holds up to the 1065 level if it drops down to test it. 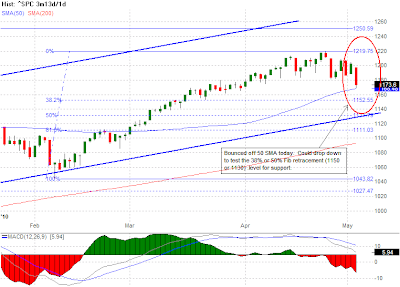 The reaction from the SP500 at these levels will give me a good picture on where is the market heading next. 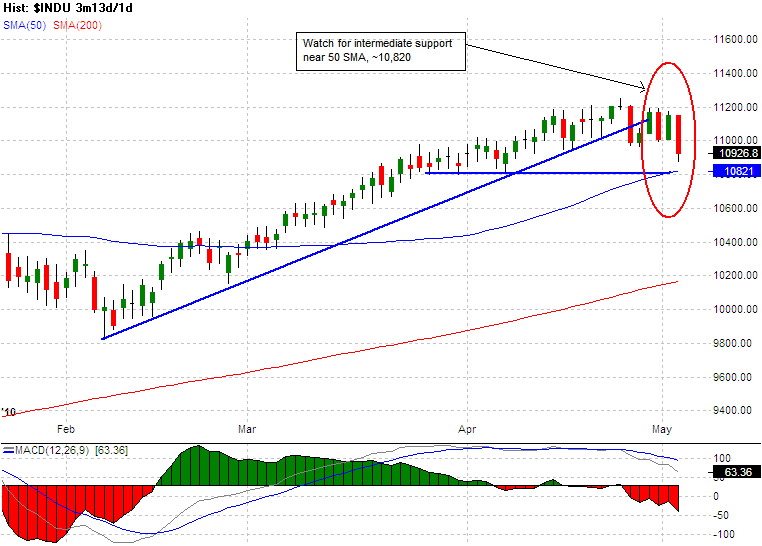 Until then, the current market condition still favors the short term trading strategies. Today the SP500 and the DJIA dropped below their February 2010 low and bounced back above it. The market rallied during the last two hours of trading and the SP500 regained all its losses and closed with a small gain while the DJIA reduced its losses from nearly 300 points to less than 23 points. As I have mentioned previously, the February 2010 low is a key support level the market must hold to avoid forming a new down trend. So far, the market is holding on to the February low. If this level is to be a support, then I will not be surprised to see a strong rally from this level before the market pulls back to retest it. The near term resistance for the SP500 will likely be the 200 SMA near the 1100. 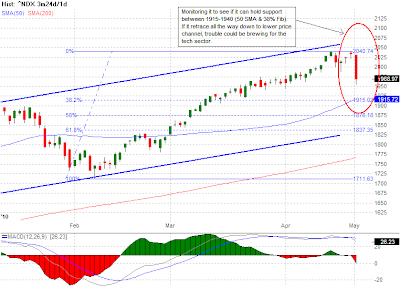 After more than a week of high volatility, some signs of possible support started to appear. 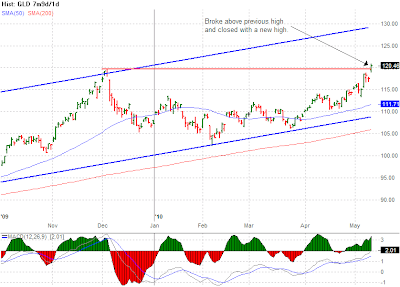 Scanning through my list of stocks, I am beginning to see a lot of them are near or at key technical level that could provide some supports. 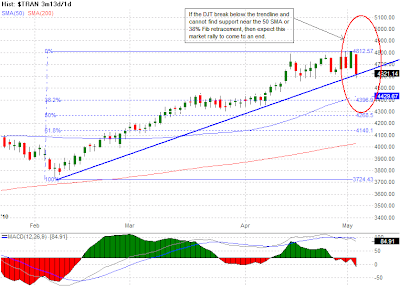 Last Friday’s opening dip and bounce back indicates a degree of capitulation. 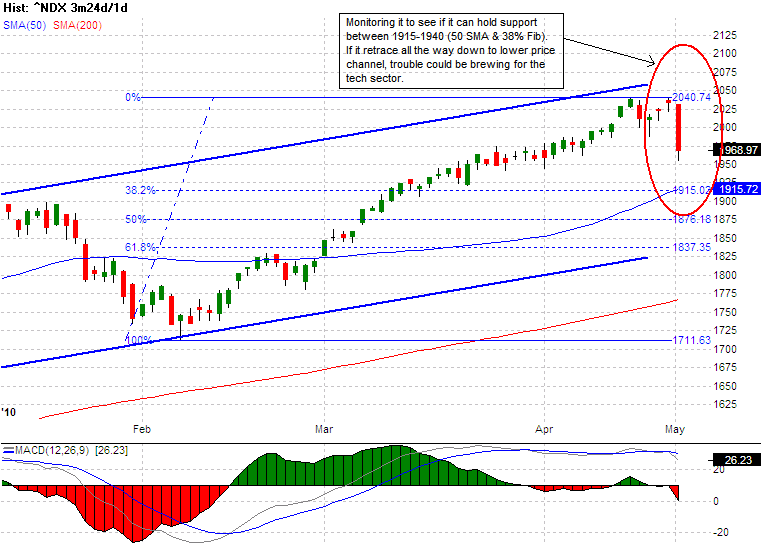 Of course, this one day bounce doesn’t mean the market is ready to head back up. There were certainly some bargain hunters came into the market to push the market up on Friday, and I believe there will be another shake down to get rid of the last holdout of the weak hands. 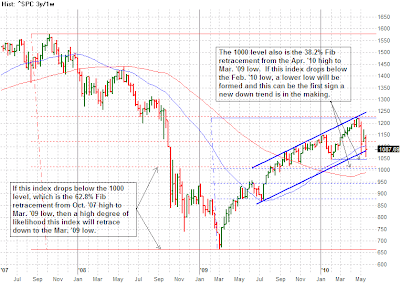 In the SP500 weekly chart I put up, one can see the level near 1000 is a key technical level. 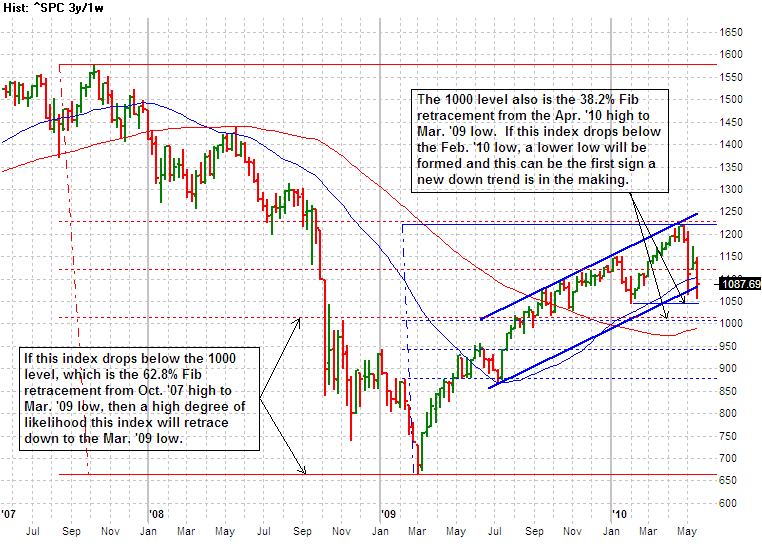 If it breaks below 1000, things can get ugly. In the coming week, we need to see some consolidation from the market and the SP500 needs to be able to hold above the Feb. 2010 low. If it breaks below the Feb. 2010 low, then a lower low will be made by the SP500 on the next bounce and this could be the beginning of the lower-low/lower-high formation for starting a new down trend. Unless I am day trading, I will remain on the sideline and wait for this market to show its hand on which direction it is going to take (retrace to Mar. 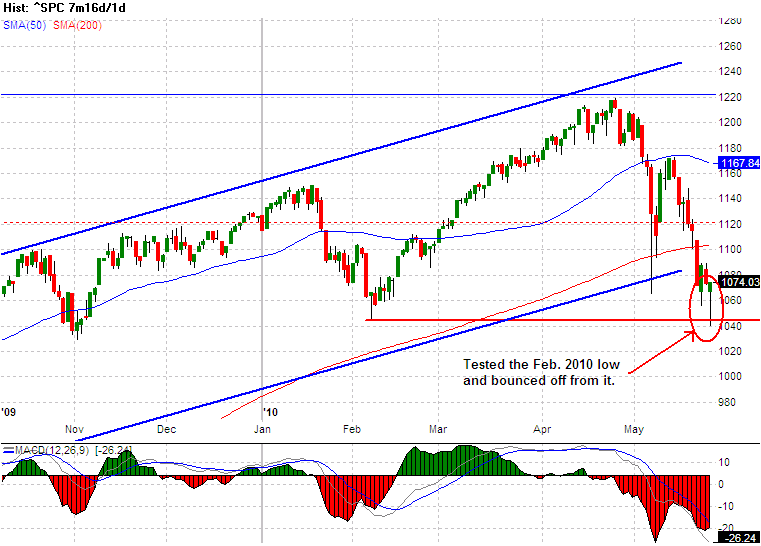 2009 low or move above the Apr. 2010 high.) Certainly I wouldn’t be surprised to see some big oversold rallies in the coming days, but I will wait for a pull back from these rallies before considering going long. The equities market continues to be volatile after last Thursday’s crash. 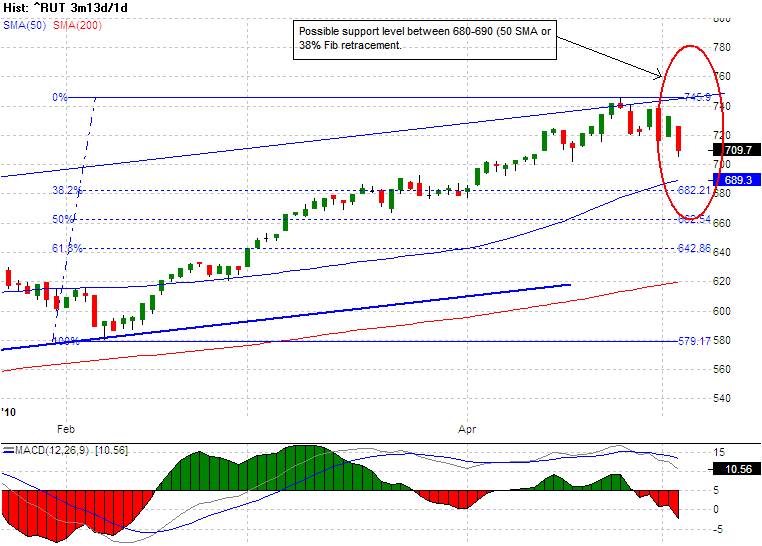 As I have mentioned before the near 1000 points dip, a new closing high for the DJIA is yet to come. I might be sounding a bit crazy, but until the market has signaled otherwise, I will continue to trade with the expectation of a new closing high for the DJIA. In the precious metals market, Gold broke above the $1200 an ounce recently and it looks like $1300 could be the next likely target. I wrote a post back in November, 2009 on gold moving to $1300 an ounce, and a follow up post a month later. The possible catalyst I thought that will cause the price of gold to move above $1200 at the time of those writings turned out not to be the case. Instead, the catalyst turns out to be the financial crisis with the PIIGS. One thing is clear, the chart provides you with clues on what possible price level to expect in the future, but it doesn’t tell you when that price level will be reached or what will trigger the price to move toward the target level. That is why it is important to have trade setups and triggers. Until the market has settled down, I will focus on trading cautiously with my high percentage setups only. Click on this link to see the chart that projected the price of gold reaching $1300 an ounce, and click on the chart below to view the latest chart for the gold ETF, GLD. Today’s market action is like a huge margin call. With the US dollar rising as the result of the Greece problems and the uncertainties from other Euro zone countries, the dollar trades were finally forced to unwind, and that triggered selling from margin calls across the board, equities and commodities. Although today’s drop raised talk about the impending correction that many traders were waiting for, but the bottom line is this market rally has not topped out. Yesterday, the DJT made another new closing high to reiterate a newer high for the DJIA is yet to come. 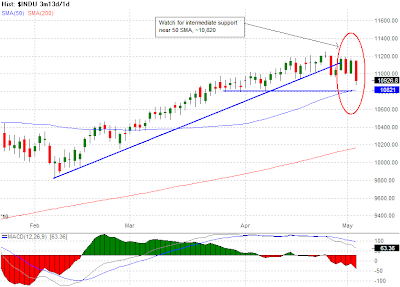 Therefore, until the market has signaled it has topped out, I will be monitor the major market indices for possible support near their 50 days SMA or the 38% Fib retracement level. One thing for certain, the selection is narrowing and this makes it much more critical to be patient and only trade those high percentage setups.